As the cold sets into Montreal through the winter season, a new overflow shelter is preparing for its third night. The Royal Victoria Hospital's temporary shelter is set up to provide extra beds for the homeless during cold snaps. 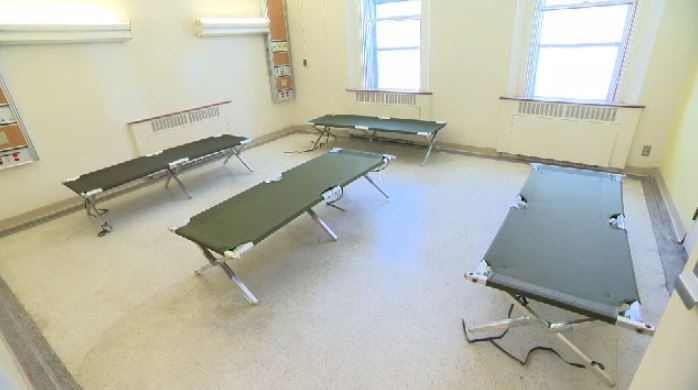 A total of 80 emergency beds are now in place in the Ross Pavilion of the abandoned hospital to help take in more people as the temperature drops. On Jan. 15, the first night, 31 people used the overflow shelter. That number doubled on Wednesday night, when the temperatures dipped to -28C with the wind chill. The shelter was put into place after several organizations, including the Old Brewery Mission, voiced their concerns about overcrowding in their shelters. “We still keep the doors open and where do we put them? We put them on the floor, or in the hallway, or in the cafeteria. It's not appropriate to do that,” said Old Brewery Mission CEO Matthew Pearce. A shuttle bus will tour the city and coax people out of the cold. Those with addictions and mental health issues are a priority, said Pearce. 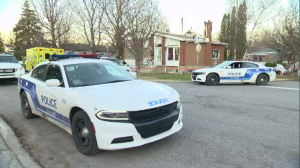 “People who have consumed drugs or alcohol and are significantly intoxicated as a result, they will be admitted as long as their health isn't in question and they are not aggressive,” he said. For the first time, pets are welcome too. The rooms have been set up with special handles allowing leashes to be tied to them. “For someone experiencing homelessness who has a pet, that pet is pretty much all they have in the world. That is so important to them. They don't really want to be separated. We think it's important to treat the human beings and the animal with dignity. This is again a bit of an experiment,” said Sam Watts, CEO of the Welcome Hall Mission. While there is an urgent need to provide extra beds this winter, the hope is that this does not just become a Band-Aid solution. “Access to affordable housing, access to affordable housing, access to affordable housing – that's really the cornerstone to any solutions to homelessness,” said Pearce. The Quebec government is working on long-term solutions, said Health Minister Danielle McCann. “We have a team here, a team of different people from different organizations that are working to considerably diminish this phenomenon,” she said. The overflow shelter is expected to open until April 15.